In this lesson we’re covering two constructions which will help to increase your range of expression: venir de faire quelque chose (to have just done something) and avant de faire quelque chose (before doing something). 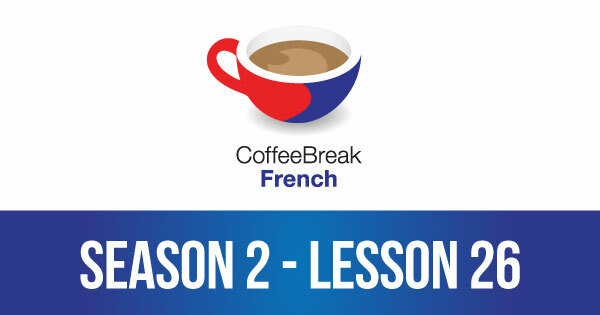 Please note that lesson 26 of Season 2 was originally known as lesson 66 of Coffee Break French. We have renumbered the lessons of each season as lessons 1-40 to make things more simple for our listeners. Does Mark have a language class in his country(Canada)? Then I would like to travel there having a 4 weeks langugae course!!! Cher Marc et Anna, et l’équipe. Merci beaucoup pour vos générosité. J’´apprendre trop vite avec vos leçons. J’ai soixante sept ans, et je très heureux avec tous. J’aime beaucoup vous Mark et Anna, mais j’adore Pierre Benoît. Il est mon favorite..